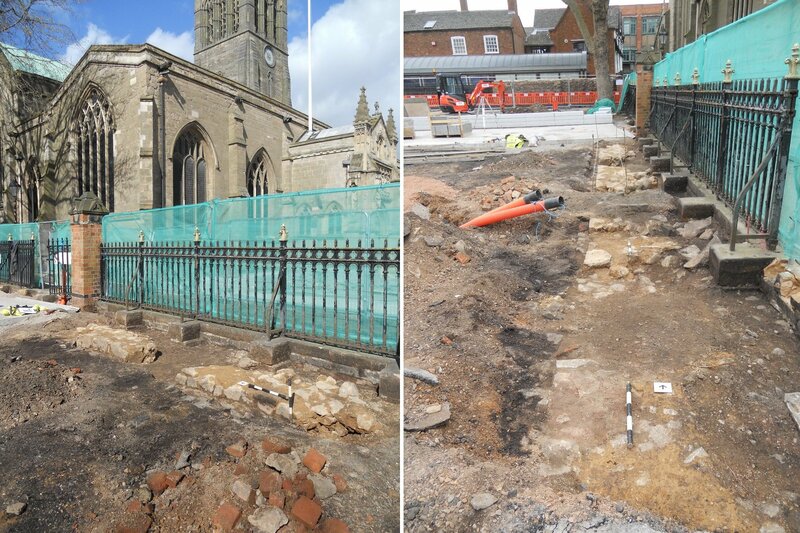 In 2013 and 2014 archaeologists from ULAS carried out a series of watching briefs during the construction of ‘Cathedral Gardens’ a new public open space located to the south and west of Leicester Cathedral. The newly completed Cathedral Gardens, looking across the site of Wyggeston’s Hosptial towards Leicester Cathedral. 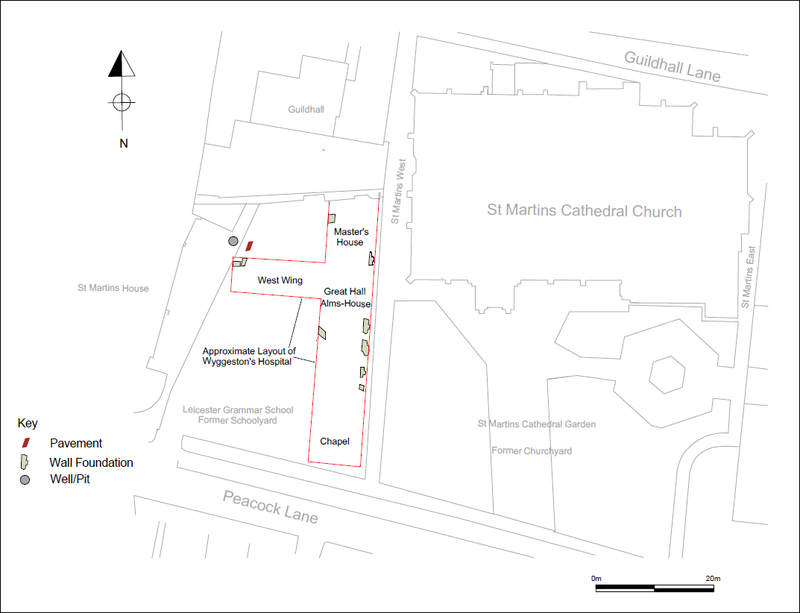 As part of this development, various ground-works were undertaken within both the graveyard of Leicester Cathedral and the St Martins House carpark. Within the carpark lay the site of Wyggeston’s Hospital, constructed in the early 16th century and demolished in the 19th century. The Hospital is named after its main benefactor and founder William Wyggeston (1472-1536) a wool merchant and three times mayor of Leicester and a parliamentary burgess for the Borough. The intention of the founder was for the hospital to care Leicester’s needy poor of twelve men and twelve women. The Hospital was erected in 1519 facing Saint Martin’s church and churchyard. The general plan of the hospital was a simple one of great hall with chapel dedicated to Saint Ursula both located at the southern end. At the northern end, opposite the church, was the Master’s house and in between the lay the alms house. The hospital complex also comprised a timber west wing. Approximate location and layout of Wyggeston’s Hospital. The excavations revealed the top of various stone footings indicating the presence of a north-south orientated rectangular masonry structure located directly to the west of the alley known as St Martins West. It is likely that these are part of the hospital’s alms-house and Master’s House. Additional truncated stone footings revealed further to the west are thought to represent the north wall of the west wing. Further stripping to the north for new pavements and service trenches revealed a probable well and brick pavement, also believed to part of the hospital complex. The overall shallow depth of the various excavated services within the hospital complex generally only reached a layer of stone rubble thought to be associated with the demolition of the building in the late 19th century. Only a potential internal clay and stone floor surface was partially exposed close to the east wall of the hospital during these works. Top of various stone footings indicating the presence of a north-south masonry wall located directly to the west of the alley known as St Martins West. 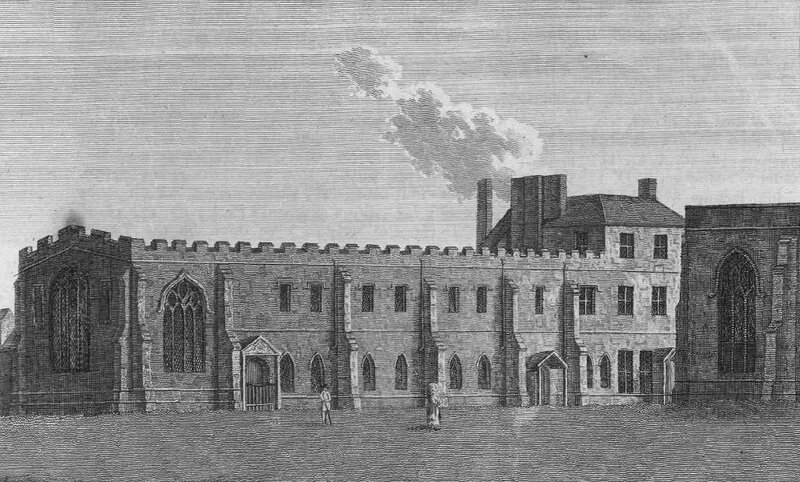 In the south-east corner of the car park, the trench for cables found no evidence of the remains of Saint Ursula’s Chapel or the great hall that once fronted on to Peacock Lane and adjoined the main hospital building. The shallow depth of the services suggests that any remains of the chapel that had survived were not reached on this occasion. Reblogged this on Leicestershire Young Archaeologists Club.